RETIRED American independent oil producer Bob Lee was well ahead of his time when in the early 1980s he built a family holiday home at remote Cape Romano on Florida's Marco Island, an almost space-age-like half dozen inter-connecting concrete domes squatting atop sturdy stilts overlooking the beach. Today curious locals and tourists alike still make their way to the Cape for a look at Mr Lee's handy-work, but rather than coming upon a futuristic marvel, they're confronted with the sad sight of his igloo-like structures now collapsed, graffiti-covered and surrounded by sea – the victims of Mother Nature at her ferocious worst. 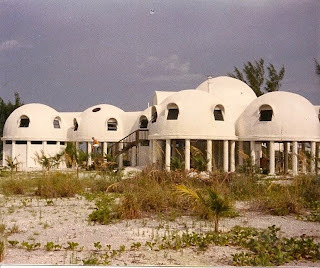 When the ever-inventive Mr Lee, a fervent tinkerer, handyman and dreamer, first thought-up the idea of a beachside dome house, he built and perfected a prototype where the family lived 1,100km away in Gatlinburg in Tennessee – that prototype still there to this day. 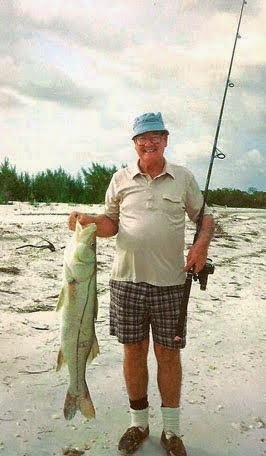 Retiring at just 44 on the wealth from his oil ventures, Bob Lee had to barge everything to Cape Romano for his isolated getaway, including even the fresh water to mix the concrete it would be built from. And as it evolved, the most bizarre of rumours spread about it: that weirdo cultists living there had it protected 24 hours a day by machine gun-tottin' guards, that it was "a ghostly scary place" ventured close to at your peril – even that it was the work of aliens from another planet. 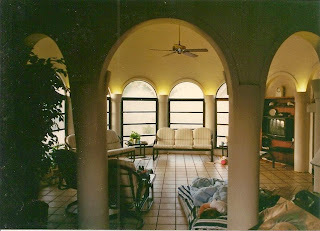 But in truth the only things bizarre about the dome house were Bob's extraordinarily forward-thinking self-sustaining inclusions, in a period of otherwise gross consumer excess. These included an 87,000 litre (23,000 gallon) water reservoir under one of the domes that was fed by rainwater off it and the other domes, and filtered and used in showers, dishwasher and toilets. There were also vast solar panels set apart from the house to generate enough electricity to power lights, air-conditioning, hot water heaters, ceiling fans, refrigerator, even a hot tub and other playthings. And for more-wintry weather Bob Lee devised an under-floor heating system – and for the family's bemusement and convenience, a conveyor to carry logs from a central storeroom, and drop them hands-free straight into the open fireplace in the den. Yet despite two years completing his amazing structure, and his love of fishing and watching the local colourfully changeable weather, Bob and Margaret Lee and their daughter Janet lived there just two years, selling out in 1984 – only to repossess three years later after the buyer defaulted. But Bob and Margaret did not move back in, offering it instead to Janet and her-now husband to live in, together with a separate Lee grandson. Cruelly in 1992 Hurricane Andrew bore down ferociously on Cape Romano, ripping away the house's outer-two domes from the rest of the structure, yet doing remarkably little other structural damage: as Bob Lee intended, the hurricane-strength winds simply sweeping around, up and over the rounded-domes. 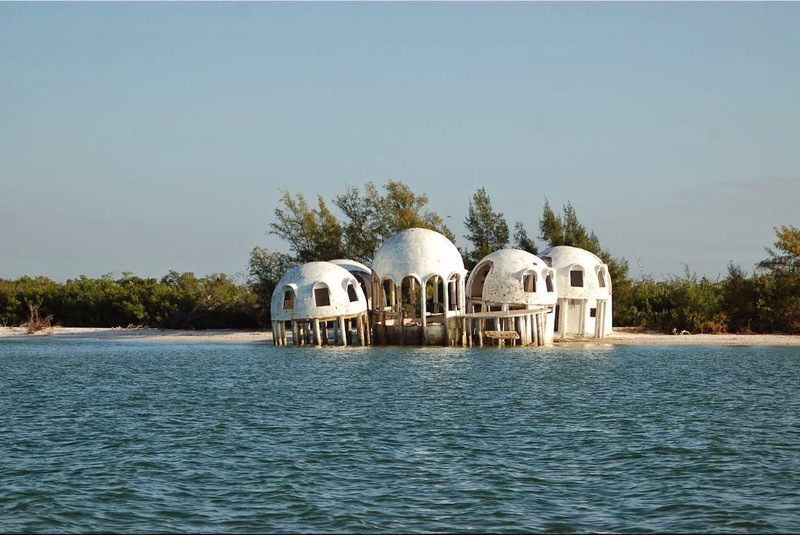 Worst damage was to the beach, much of which was washed away… leaving the space-age house that once stood inland amid sand and palms, now being lapped by seawater around its two outer-most domes. 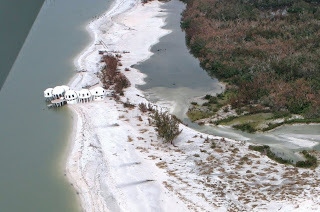 And when the Lee's sold it once more, unfortunately for the new owner, just a few months later another hurricane, Wilma in October 2005 pounded Florida with devastating 190kmh winds. This time the house was less lucky. Numerous of its pillars were fractured by the massive seas, the domes subsequently slumped perilously, while wind and rain trashed interiors. And with much more of the beach gone and the house now forlornly stranded "off-shore" over 100m from where it had originally been built, the Environmental Protection Agency and local county authorities ordered its total removal. 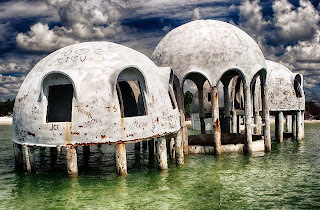 But instead of complying the new owner simply walked away, and today the post-apocalyptic-looking remains of the dome house of Cape Romano are purely a curiosity for visitors. "It would break Daddy's heart to see it like it is," daughter Janet (Maples) said recently. "But he always said before he died, that it was worth it for the time he had it. "It was just beautiful at one time." Struth! On the nose. Australia's biggest truffle.